Join in and have a Brew & A Chat on Monday 15 April, 10:30am-12:30pm organised in conjunction with Calderdale Staying Well. This month, Emma Worsley from VAC (Voluntary Action Calderdale) will be visiting. Emma will be filming two gentlemen in their eighties who rekindled their school day friendship at the Brew and Chat sessions. Emma has a one hour slot on Phoenix Radio every Friday morning discussing what is happening in our local area. Hope you can join in to showcase just how successful the monthly Brew and Chat actually is! Every Thursday, 10:30am there is a ‘Walk Away the Pounds’ session in the Community Hall. A DVD is shown detailing the walking moves and with the music. This is open to all ages, men and women and is just £3 per session. Comfortable clothes and non-slip shoes will be needed. 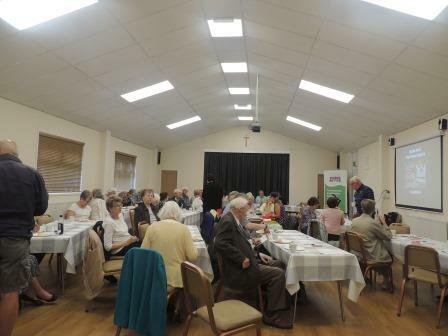 St Columba’s Church Hall have received funding from the Warley Staying Well Steering Group and Community Foundation for Calderdale, as well as from Calderdale Council’s Ward Forum Grants.